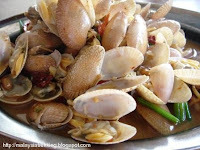 On the 3rd day of Chinese New Year 2008, together with 3 friends and my family decided to visit our friends in Kelantan (Kota Bharu - state capital). 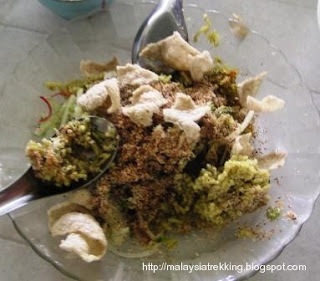 We have plans to stay in Kelantan for 2 nights and then proceed to Nibong Tebal (Penang) to visit another friend and stay for a night. 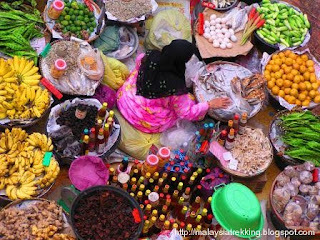 Kelantan is the east coast state of West Malaysia and is known as a charming destination with colorful traditions, handicrafts and food. 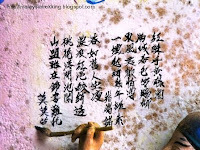 It is festive holidays and bookings for hotels room are scarce. 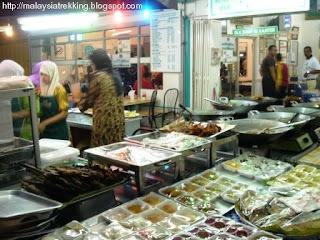 Instead our Kelantan friends recommended budget stay or salesman club stay at RM$20 per person per night. So why not to expect a different kind of experience. Day 1. 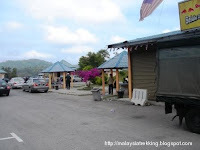 Our trip started on Saturday 9, Feb 2008 (7.30am) and our takes us through KL - Kuantan highway where we turn off at Bentong which was to be our breakfast stop. 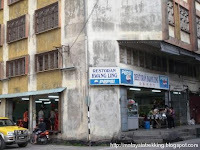 Bentong is about 80km from Kuala Lumpur. 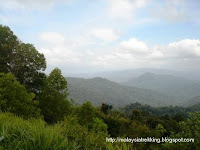 The morning air was cool and refreshing especially with the windy season. 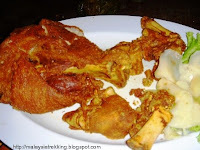 There are actually many interesting places to visit on the outskirts of Bentong but Kelantan was waiting and the route from KL - Bentong - Gua Musang - Kota Bharu (Kelantan) would take about 7/8 hours of leisurely drive including breakfast and lunch stops. 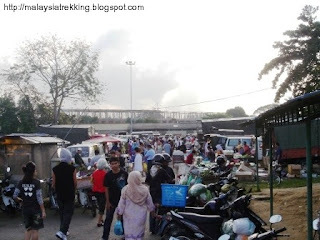 And finally arrive at Kota Bharu around 4.00am, the journey took longer than usual because of the increased traffic especially we were told that Deputy Prime Minister Dato' Seri Najib Tun Razak was attending a function in Kelantan which explains the heavy traffic (election year). 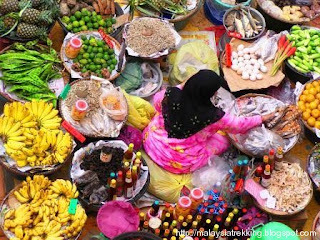 The majority of Kelantan people are Muslims and therefore their weekend holiday starts on Thursday and Fridays and Saturdays and Sundays are working days. 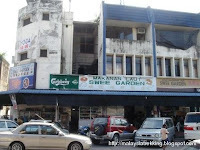 Having last visited Kota Bharu 10 years ago, I was surprised with the increased number of cars on the road and with new buildings and road changes. 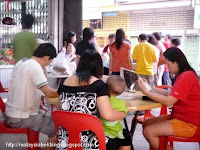 Our friend HW Tan guided us to his house which we promptly found with his road directions. 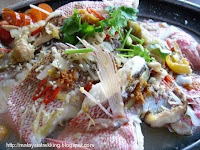 HW Tan welcome us with the warmest hospitality and immediately we felt very comfortable at his place. 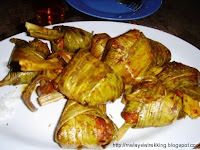 HW Tan who had planned to return to Kajang on Sunday, graciously delayed to Monday so as to bring us to interesting places to visit in Kelantan. 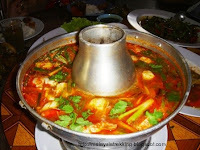 Our first place to visit was to 'heal our stomach' or dinner at Chiengmai. We immediately protested that none of us brought our passport, HW Tan continued and said 'Chiengmai Restaurant' much to our amusement. We left early at 5.00pm to avoid the heavy traffic. 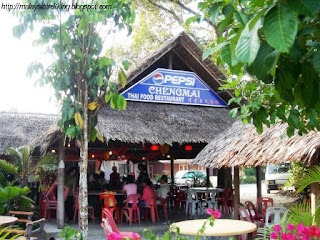 Chiengmai Restaurant is situated around Tumpat district. After dinner we check into our budget accommodation which look and feels like a home. After the long drive, nothing like a hot cup of tea or coffee at a nearby cafe. HW Tan told us tomorrow's itinerary starts at 7.30am. Day 2. HW Tan arrive promptly at 7.30 and everyone was ready. 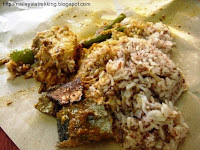 Breakfast, Nasi Dagang at Restaurant Kwang Ling. 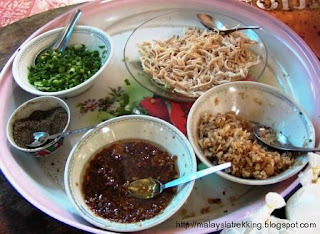 The favorite Kelantan breakfast meal for everyone. 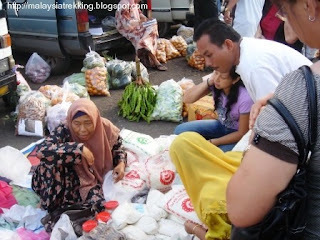 Visit to the Padang Market (Open air Wholesale Market) which will close by 9.00am. 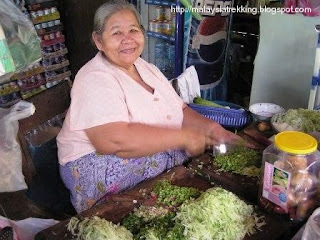 Here plenty of local and Thai goods available. 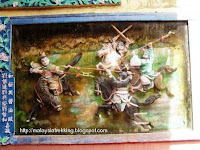 Handicraft Village and Craft Museum which is closed situated to the Padang Market. The complex houses a craft museum, plenty of handicrafts shops, sometimes cultural shows and crafts demonstration (with traditional tools) are held here. 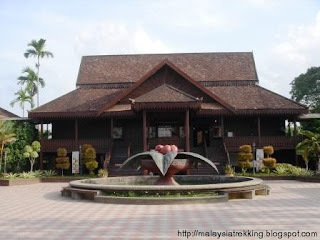 Also nearby is the Istana Batu (Royal Museum) which was originally a palace and venue for royal weddings. It was not open to public on that day and we only took pictures from outside. 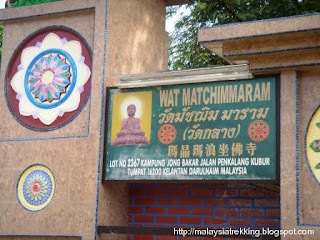 Next on our itinerary was to visit the Wat Machimmaram, a Buddhist temple with one of Southeast Asia's largest statue of Sitting Buddha. 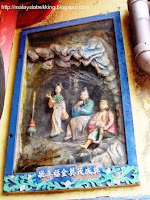 Inside the temple complex you can see many paintings and three dimensional paintings. 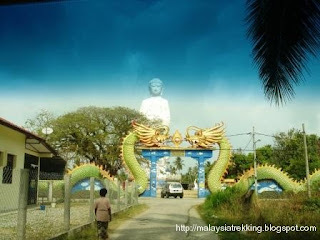 Visit to Wat Photivihan, which is the most famous Buddhist temple in Kelantan. 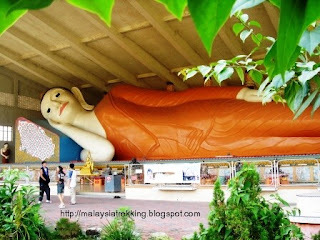 It contains the biggest statue of the Reclining Buddha in Southeast Asia. 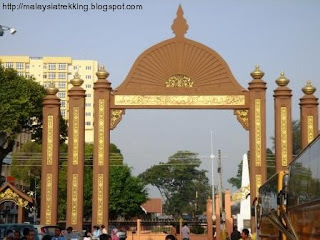 The statue which measures 40m long and 11m high and 9m wide was completed in 1979, after six years of construction work at a cost of RM350,000. 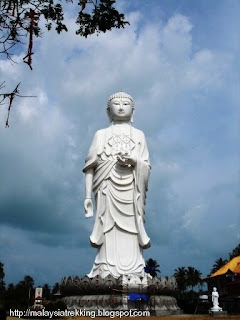 The funds came from public donations and the Buddhist Association of Malaysia and Thailand. 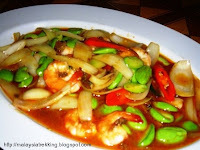 It was the brainchild of Tok Phra Kru Prasa Prachacorn. 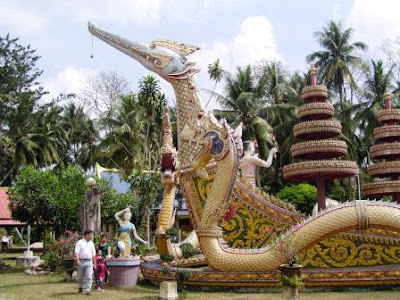 The temple is located in Kampung Jambu in Tumpat near the border of Thailand. 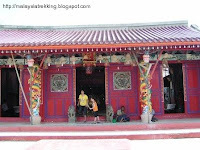 It also has herbal bath like most Buddhist temple in Kelantan. 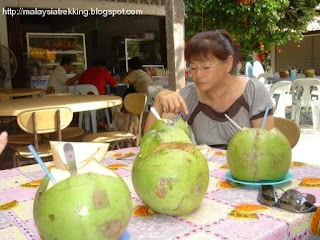 What better way to quench your thirst on a hot day with coconut drinks. 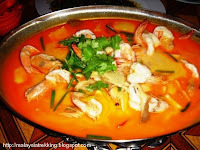 If you can stomach this try a local delicacy which has Thai influence and is called 'son dum' consisting of raw papaya, mango, special gravy sauce, fermented fish and mini crabs. 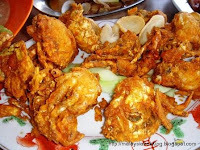 The taste is a little spicy, fishy, sourish and sweet. 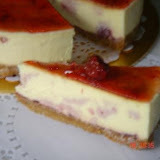 Eat and don't think, you will find it tasty but the minute you think.. arrgggghhh! 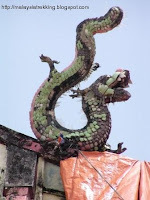 Visited Wat Mai Suvankhiri featuring a huge dragonboat but not seagoing. 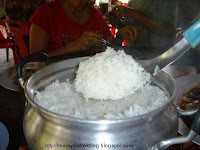 Lunch time at another local delicacy called 'kow cyump', it used to have 99 ingredients but today it has been cut down to important ingredients of vegetables and with herbs pounded and sprinkle over rice with vegetables, fish and prawn crackers. 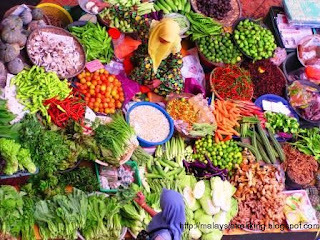 I find this a healthy diet with lots of vegetables and herbs. 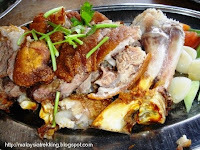 At a special price of RM$1.oo per plate, thats even healthier on our wallets. Also available, porridge with chicken strips. 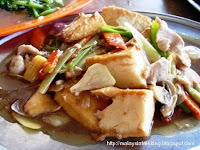 Eleven of us ate to a cost of about RM$50.00. 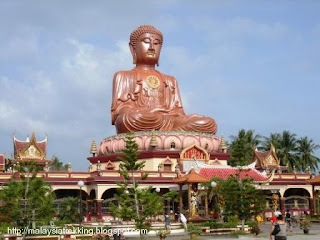 Wat Phothikyan which is situated in Kampung Balai, Bachok. 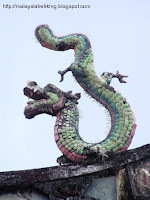 The entrance consist of The Twin Dragons and inside the temple grounds stands the Statue of Amithaba, Buddha. When completed stands at 108 feet. The project started in 02/11/2002 and is almost near completion. Visited a 221 years old temple with authentic architectural design and construction, it was built by local Chinese fisherman. 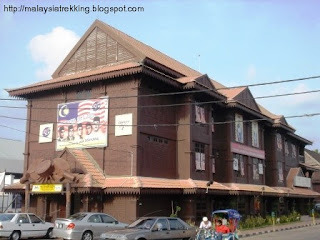 Finally a visit to the Siti Khadijah Market, it is one of Kelantan's landmark attractions. 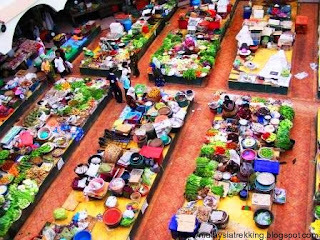 The unique feature here is that the majority of traders are of the women folk. Picture below taken from above makes it very colorful. Took a rest, everyone was tired as we have squeeze 2 days of sightseeing into 1. 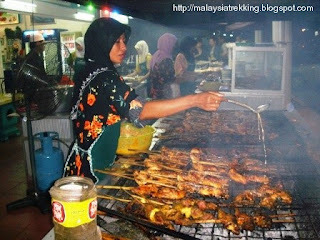 Dinner tonight not to be missed is famous Ayam Percik Kelantan style. 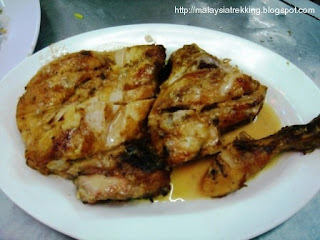 There are many places to have this and our host HW Tan took us to Yati Ayam Percik. 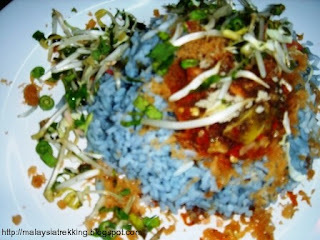 We had Nasi Kerabu, ayam percik and kuih kuih for dinner. 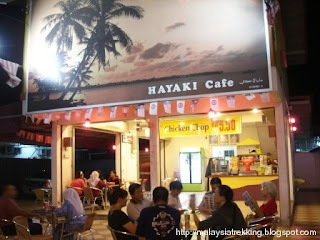 Went to rest and relax at Hayaki Cafe in the heart of Kota Baharu and watch the locals go about their daily life. 3rd Day. 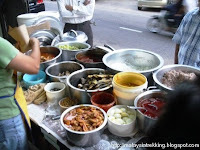 Decided to go back for Nasi Dagang to sample other various combinations. 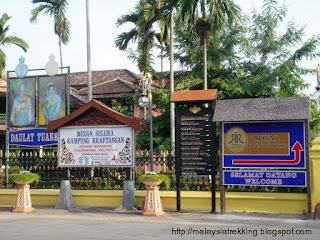 And continue our trip to Nibong Tebal, Penang. 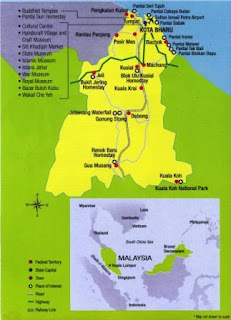 We have to drive to Machang - Jeli - Grik and take the new highway towards Baling before hoping on the Penang - Nibong highway to exit. Sounds complicating, well actually it was a leisure drive. 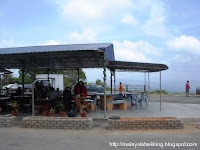 As you pass Jeli, the road will ascend to about 3000 feet, because of the exposed main range you can wind down the windows and enjoy the cool and refreshing breeze until the top where there is a Rest & Relax area which is managed by Restaurant Amiza Titiwangsa. The toilets here are clean. I mean really clean! 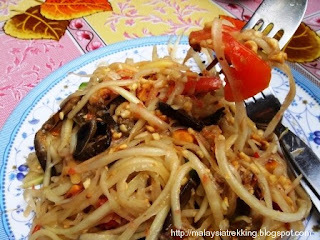 We decided not to make any stops and go straight to Nibong Tebal for our lunch. 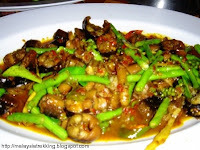 Upon arriving around 2.00pm the usual restaurant (Cheang Kei) was closed for the festive season, instead we went to Swee Garden Seafood Restaurant. 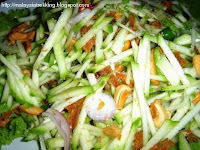 It looks like to celebrate the Chinese New Year 2008 we cross over to Kelantan and on the way pass by many major and smaller towns visited places and plenty of food. 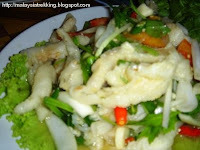 After the four days and the benefits to everyone was about 2kg in additional body weight. 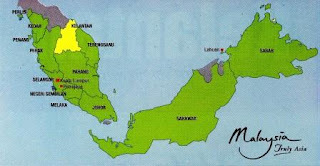 Had a enjoyable time and wondering when we will visit Kelantan, hopefully in the near future. 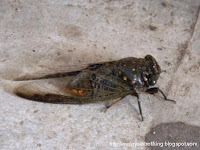 Click on the above to see photo slide.